Learn How To Play 'Happy Birthday' On The Piano! Today we are going to learn to play "Happy Birthday". It is a familiar song to very many people. We are going to learn to play it as an exercise on developing your ear. There are many cooler songs out there that I'm sure you'd like to play, but this is about developing your ear. Let's start on D and sing the song in our head. "Happy birthday to you". Here is where we use intervals. It just goes up a bit. D D E D G F# are the notes of the fist verse. Now we want to try and figure out our key. The last note of that verse doesn't really give us a resolved feeling. If we sing the song in our head, we'll notice that the second time the line is sang, it ends differently. The second time the phrase ends with A G instead of G F#. The G at the end of the second line gives us that resolved feeling. That is a clue that we are singing the song in the G major scale. Another clue is that the song has an F# and so does the G major scale. Since we started singing on D, we know that the first note of the song is the fifth note of the scale of the key that the song is in. Let's finish picking out the melody using our ears. We end up with D D, then D an octave up, B, G, F#, E, then for the next line C, C, A, G, A, G. So, with the melody figured out let's write some chords. Normally a song starts on the root chord, so let's start with a G chord. When the melody gets to the F#, the chord wants to change. Let's see which chords have an F# in them. D and B minor both do. If we try both of them, we find that the D sounds a little better, so let's use that one. We can return back to the root chord when the melody returns back to a G.
Next the melody is going to come to an F#. We are going to change our chord there, but the F# is sort of a passing note, so let's target our chord change on the following note, the E. Let's try a C chord with that part of the melody, the C chord has an E in it. Then we can go back to the G chord. Let's finish off with a D chord, which will drive our ear back to the root chord when we repeat. 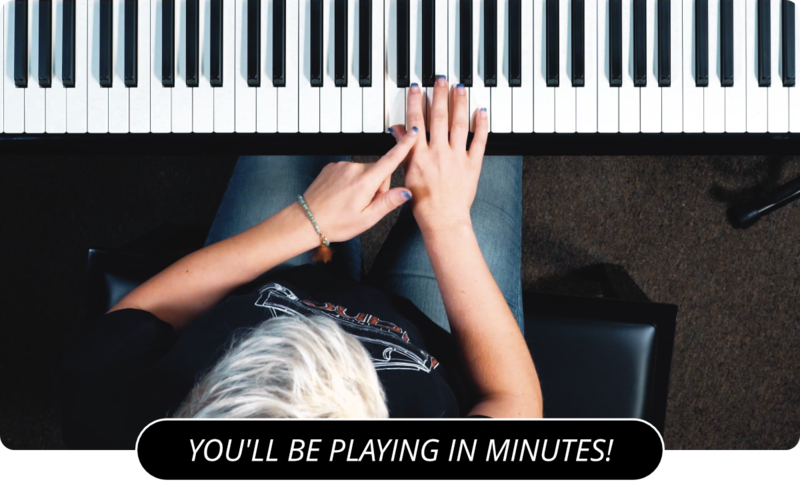 Visit the Piano Covers section for a complete list of song tutorials.